In Italy, the highly touchy budget debate witnessed some reconciliation over the weekend. After holding a hard line for a 2.4% budget deficit in recent weeks, recent reports reveal that the Italian coalition is considering a cut to its 2019 deficit projection with a new target from 2.0% up to 2.1% range that should appease the European Union (EU). Meanwhile, the European Central Bank (ECB) President Draghi says the data that has become available since September has been somewhat weaker than expected therefore the Governing Council continues to anticipate that, subject to incoming data confirming our medium-term inflation outlook, net asset purchases will come to an end in December 2018. The underlying strength of domestic demand and wages continues to support our confidence that the sustained convergence of inflation to our aim will proceed, and will be maintained even after a gradual winding down of our net purchases. The loss in growth momentum mainly reflects weaker trade growth, but also some country and sector-specific factors. The final consumer price index (CPI) in the Eurozone rose to 2.2% year-on-year in October compared to the 2.1% rise registered in September and consistent with analysts’ estimates of 2.2%. It was the highest inflation rate since December 2012 on rising prices of services, energy and industrial goods. A high reading anticipates a hawkish attitude by the European Central Bank (ECB), which is seen as positive for the EUR, on the other hand, a low reading is perceived as negative. On the other side of the Atlantic, the University of Michigan’s consumer sentiment for the US fell further to 97.5 in November, comparing to 98.6 registered in October and failed the preliminary reading of 98.3. It is the lowest value in three months. Both current conditions and expectations were revised lower although the drops were more related to income. It shows a picture of whether or not consumers are willing to spend money. Generally, a high reading anticipates positive for the USD, while a low reading is seen as negative. Since the beginning of 2018 until last Monday close, the EURUSD remains negative with a loss of over 5.5% and since the start of November is slightly above water with a minor gain of 0.11%. Nonetheless, the weekly stance is relatively flat with a minor loss of 0.06% and on the daily time-frame, the currency pair closed in the red with 0.06% loss. Furthermore, the EURUSD remains in a bearish phase since early October. 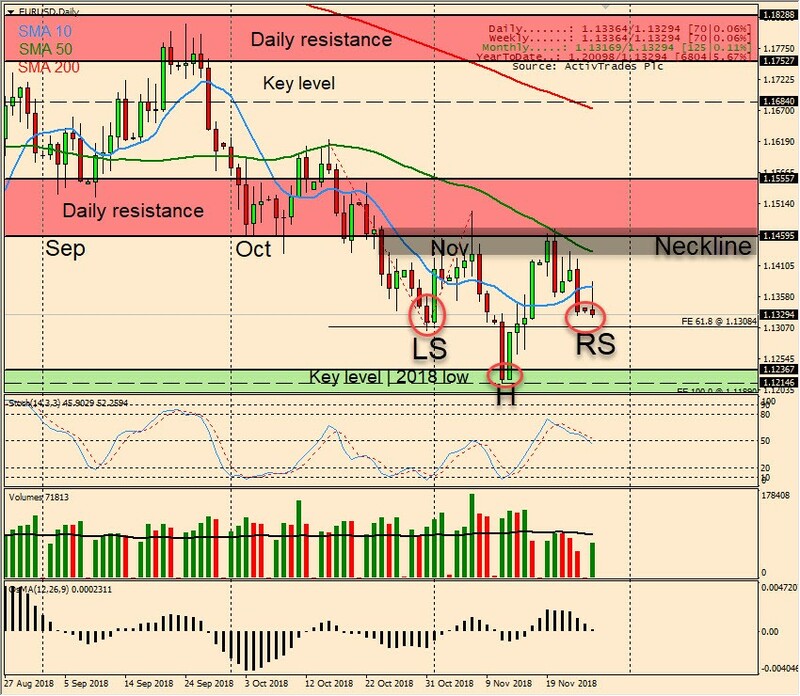 On yesterday session, the currency pair initially rose with a narrow range but found enough selling pressure near the 10-day moving average at 1.1376 to trim all of its gains and closed near the low of the day, however, managed to close within Wednesdays’ range, which suggests being slightly on the bearish side of neutral. The stochastic is showing a strong bullish momentum and crossed below the 50 midline. The currency pair ended October setting a new year-to-date low at 1.1300 setting the stage for an early rally in early November that came to a halt on a daily resistance at 1.1460. Since then made a new year-to-date low at 1.1214 and bounced back down again from daily resistance at 1.1460. As a major reversal pattern, the Head and Shoulders Bottom forms after a downtrend, and its completion marks a change in trend This back and forward daily movement seems to be developing an inverted head and shoulders pattern. The pattern contains three successive troughs, the first trough is considered the left shoulder (LS) and third trough are acknowledged as the right shoulder (RS), and the second trough forms the head (H). A move above the resistance, also known as the neckline, is used as a signal of a sharp move higher. Wednesday, November 28 at 17:00 GMT (12:00 ET): The Federal Reserve (Fed) Governor Jerome H. Powell is scheduled to speak. As head of the Fed, which controls short-term interest rates, he has more influence over the US dollar value than any other person does. Traders closely watch his speeches as they are often used to drop hints regarding future monetary policy. Thursday, but at 19:00 GMT (14:00 ET): The Federal Open Market Committee (FOMC) is scheduled to release its meeting Minutes, which are released by the Board of Governors of the Federal Reserve (Fed) and are a clear guide to the future US interest rate policy. Friday, November 30 at 10:00 GMT (05:00 ET): The Eurostat is scheduled to release the Eurozone preliminary consumer price index (CPI) year-on-year in November, which is expected to drop to 2.1%, comparing to the 2.2% registered in the previous period. The CPI is a significant way to measure changes in purchasing trends and inflation in the Eurozone. Generally, a high reading anticipates a hawkish attitude by the European Central Bank (ECB) which will be positive for the EUR, while a low reading is seen as negative.